Enjoy a workout for the mind, body and soul — and get close to nature — on this all-day paddleboard adventure on St Petersburg’s natural Spring River. 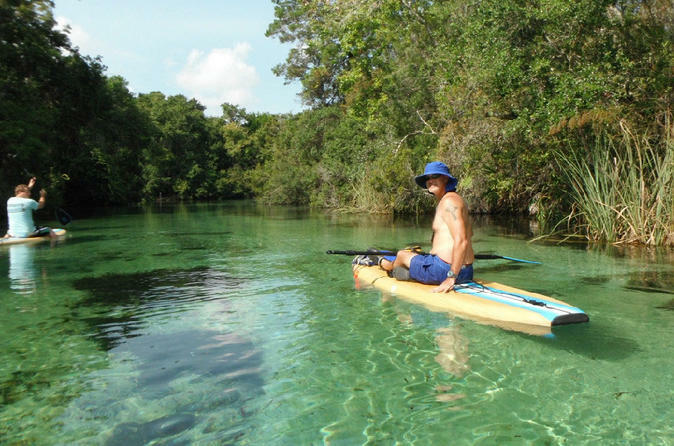 Learn the basics, then hop on board, catching the easy downstream current and floating through some of the most beautiful scenery in all of Florida. Learn about the tropical surroundings and habitats along the way, then jump in the warm water for some snorkeling and swimming. This small-group experience is limited to just six people, ensuring personalized attention. Hotel transport included. Following a hotel pickup in downtown St Petersburg, it’s off to the peaceful calm of the natural Spring River and a day-long adventure on the crystal clear waters. One look at this gorgeous river and it’s easy to see why so many people are in awe of its beauty and tranquillity. Each day, more than 117 million gallons of clear, fresh, warm water bubbles up out of subterranean caverns and runs at five miles per hour (8 kph) along 12 miles (19 km) of river into the Gulf of Mexico. The 5.5-mile (9-km) trip is breathtaking, providing some of the most beautiful scenery anywhere in Florida. Since this is a paddleboard tour, the guide will provide some simple instructions for balancing on the board so the trip is as easy and comfortable as possible. From there, simply enjoy the journey, floating with the current and taking in the scenic beauty. Watch for manatees, fish, turtles and other wildlife swimming below or gliding down and around from above. Learn about the local ecosystem and the history of this stunning river. Bring a lunch (the guide will carry it in a cooler) and enjoy a break on the shore. Take a swim, do some snorkeling or for the really playful soul, swing from a rope and splash down into the warm water. It’s an unforgettable experience through the most beautiful version of old Florida.